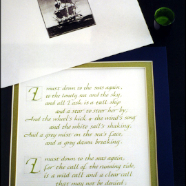 Given to a father by his son, this was commissioned for a 60th birthday. 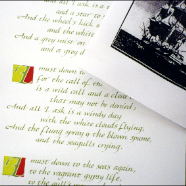 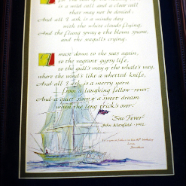 It is based on John Masefield's poem, "Sea Fever." 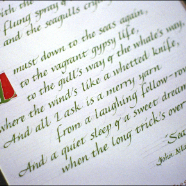 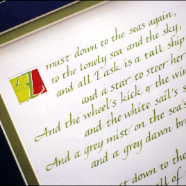 It features color-blocked initial caps (to have a sort of semaphore feel in keeping with the nautical nature of the piece), and the use of gouache for the Italic calligraphy and watercolor for the illustration.